Sept. 2013 – GHOST HOLD: Book two of The PSS Chronicles , a YA paranormal thriller series. Available in e-book and paperback. Oct. 2014 – GHOST HEART, Book three of The PSS Chronicles, a YA paranormal thriller series, Available in e-book and paperback. June 2016 – GHOST HOPE, The fourth and final book of The PSS Chronicles, A YA paranormal thriller series, Available in e-book and paperback. March 2008 – “The Derby” in Andromeda Spaceways Inflight Magazine issue #33. Dec. 2009 – “Over the Rim” in Andromeda Spaceways Inflight Magazine issue #42. Aug. 2010 – “Sister of the Benevolent Gods” as an audio podcast with Cossmass Infinities. January 2011 – “Broken Water” in the premiere issue of State of Imagination magazine. April 2011 – “The Bus to Nostalgia” in Tales for Canterbury (print and e-book). June 2012 – “Mary had a Unicorn” in Light Touch Paper, Stand Clear (print and e-book). Sept. 2011 – The Complete Guide to Writing Paranormal Fiction from Dragon Moon Press, a chapter on characterization. “Traveling by Petroglyph” was nominated for the Micro Awards 2008. “The Derby” was nominated and short-listed for The Sir Julius Vogel Awards Best Short Story 2009. 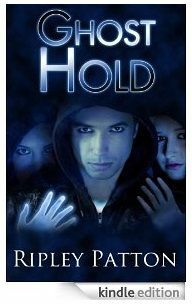 GHOST HAND: Book one of The PSS Chronicles, Semi-finalist for The Kindle Book Review 2013 Best Indie Book Awards in the YA Category. GHOST HAND: Book one of The PSS Chronicles, nominee for the Cybil Awards 2013 in the YA Speculative Fiction category. GHOST HEART, Book two of The PSS Chronicles, nominee for the Cybil Awards 2014 in the YA Speculative Fiction category. “Corrigan’s Exchange”- winner of the 2009 Sir Julius Vogel Award for Best Short Story. Ripley won the Sir Julius Vogel Award 2011 for services to Sci-fi, Fantasy, and Horror for founding SpecFicNZ. Jan-March 2006 – “Sister of the Benevolent Gods” quarter-finalist for the Writers of the Future Contest. “The Future of the Sky”- Winner of the Au Contraire short story contest 2010, judged by Sean Williams. “Over the Rim” Won the SpecFicNZ “A Cover’s Worth a Thousand Words” contest in 2012, winning a free cover design by Kura Carpenter Designs for publication of the novella.